Thank you for your deep concern and comments you have shared regarding my food and litter box plight. In the face of intruders and houseguests, especially those bearing pajamas and toothbrushes, I have been forced to resort to extreme measures to insure my safety and well being. As Stealth Kitty I am able to slink through the townhouse in the wee hours of the night without detection. I am able to pass through the living room where the intruders in feet pajamas snore away, oblivious to my stealth-like moves, and continue into the kitchen where my food and water dish wait quietly for me. After a quick refueling, I move on, slithering down the steps to the danger zone known as the guest (intruder) sleeping room. I must enter the room undetected, sneak silently past the bed and finally, into the bathroom. MY bathroom. This is where my box resides. Mind you I must pass within only 3 feet of the smelly snorer as they snooze away on one of MY beds. I also take great care to limit the fervor with which I dig in my box. The last thing I need is a middle-of-the night close encounter in my bathroom. Once my business is done I quickly exit the intruders room and make my way up the winding staircases of the townhouse. Another quick pit stop for sustenance. It's dark and scary, but my mask gives me secret night vision powers. And my cape keeps me safe from flying blankets or pillows should the sleeping intruders regain consciousness and become defensive. But you won't hear me roar. YOu are too funny and too adorable. 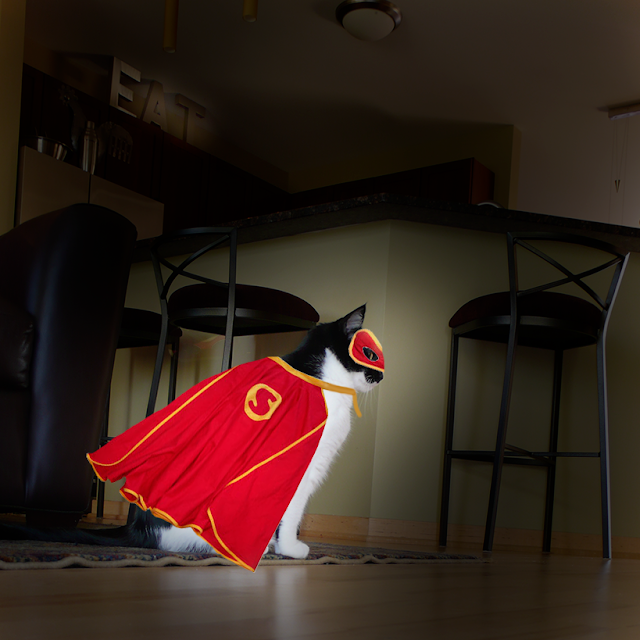 You go stealth kitty..Love the cape and mask..
You really made me and my Mom laugh, with your great adventure. You are very cute in your cape and mask. I wish my kitty sister Molly was more stealth, when she uses her bathroom, it sounds like she's digging to China! Katie this is an excellent idea! OOooohhhh!!! I know a super hero! Can you teach us some stealth kitty techniques in case we ever find ourselves in such a situation? Katie, that is a purrfect solution! Stealth Kitteh is very powerful and can defeat any Introoder foe. Excellent solution for a nasty situation. Plus the cape and mask look good on you. You might consider biting a toe or two while in stealth mode. You are a beautiful and talented stealth kitty. No one will detect you in your special outfit. Its a unique outfit !!! Wow Katie, you are very stealthy. Next time you must make Glogirly make you a cloak of invisibility. Love your pictures Sealth Kitty. I love to go and stare at sleeping visitors, but run away from them if they are awake. MOL! You are stealth kitty! We just love your cape and mask!! When will the comic be out? I'm glad taking on a alter ego helps! Sorry for taking so long to visit. Mom finally got around to updating my reader. You're on my list now, so hopefully, I'll get to visit more often. Well we were relieved to hear about your magical powers. We were worried about you with those introoders around. Red is your color Katie. That is the purrfect solution. No-one would ever know you had passed them on the way to your food and litterbox. Cute outfit! Surely that cape endows you with some super powers. Oh My..you are hysterical. Pleae do not leave any paw prints so those toothbrush peoples don't find you. Looking good Katie! Love a girl in a cape! Great idea, Katie! Can you teach us how to be stealth kitties, too? We could use this to sneak up on each other undetected - or better yet, sneak up on Mom and scare the begeezus out her! hehe! Katie, I love your mask! Your cape is pretty cool too. I'm so glad to hear you got your business done and got to eat all the while being undetected. You go, Stealth Kitty! Well this plan is fool-proof Katie! You're so smart! or...Stealth Kitty? wow you are very special and intelligent!I loved your pictures you are really adorable! Glad to know this fabulous news! WOW! Stealth Kitty, yoo are pawsome! Stealth Kitty, too perfect! Merry Christmas. Excellent plan and excellent execution, you are indeed a stealth super hero!!! It it's a good thing you are on "good" side with your Stealth Kitty persona. Stealth Kitty could have joined the "dark side" and put the bitey on all of the guests feet or pooped in their shoes. Great technique, Stealth Kitty! I usually just crawl along on my belleh. Wow Katie you have your whole thing planned out. That is so great that you are able to avoid the intruders like that! You sure are one stealthy, sleuthy kittie! LOVE the mask and cape. Had NO clue it was you...or is it??? kitty you are uber smart! There are 3 videos, and there are links to your video as well as your blog. Read everything on the page that you go to after clicking "read more" It will give you all the details. You have to read to the bottom, cuz there are more instructions about how to use the video. Peggy's Place is on the 1st page. You are 2nd I think and then there is House of Cats. Meowy Christmas to you & your Glogirly & Gloman! Let me know when you have seen the whole article!!! my brother Lego is tabby, he is nearly 2. So nice to be friend with you!! I didn't know that you were a super hero! This is so cool. How long will the intruders be staying? Sounds like you have worked out how to get along while they are there. You really look great as Stealth Kitty. How challenging for you to have to pass the intruders in order to get to your litterbox. The mask and cape are sure to help with that. 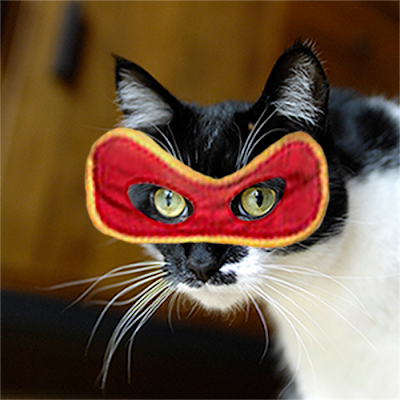 Stealth Kitty, you look so amazing in your super hero suit! 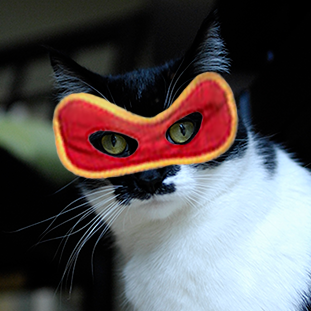 We love super heros in our house - especially the feline variety!